Are you intrigued by roller derby but have never had wheels on your feet? Rolla Skate Club can get you up to speed with their learn to skate classes. These classes are progressive over several weeks and are ongoing throughout the year so you can join anytime! To get started, join our Mix Tapes Facebook Group to get in touch with us or email us at recruiting@tcrd.ca. We’ll get you set up with Rolla Skate Club who will help you figure out your toe stops from your t-stops. When you’re ready, come to our practice and we’ll move on to roller derby! 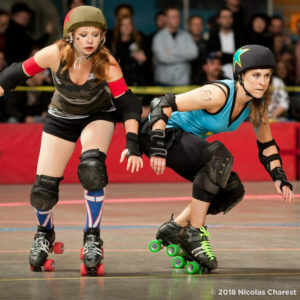 If you already have some skating skills, but aren’t quite sure you’re ready for roller derby, reach out to us and we can help you decide what’s best for you. Our league has been around for over 10 years and Rolla Skate Club is run by two alumni (Luludemon of PivotStar Apparel & Booty Quake of Roller Derby Athletics – picture above jamming against each other! ), so we know our stuff and love guiding new skaters into the wonderful world of roller derby! For brand new skaters or anyone else without their own gear, Rolla Skate Club offers rentals with their classes so you can try before you buy. And, when you’re ready to commit, head over to RollerGirl (online or at Main & 11th in Vancouver) to get set up with all the skates, wheels and pads you need! We recommend all skaters have MSP or other health coverage before starting to skate anywhere and Canadian Roller Derby Insurance (CRDi – $55/year) is required for all skaters in our league. TCRD aligns with the Women’s Flat Track Derby Association (WFTDA) stance on gender and welcomes people of all genders as league members and women and gender expansive skaters as rostered teammates. This means that we have officials, coaches and volunteers of all gender identities and that our players identify as female or gender expansive.